The Forgotten Men of Freestyle! RADBMX.CO.UK | Old School BMX 1980 - 1988 | Old School Freestyle (frame stands and kickturns galore!) | The Forgotten Men of Freestyle! No thank you, Turkish; I'm sweet enough! Here's a couple of forgotten men of freestyle for you...who is yours. US - Donovan Ritter - he was a rad mo fo was Ritter but you never hear his name mentioned much these days. Do you know what "nemesis" means? A righteous infliction of retribution manifested by an appropriate agent. Personified in this case by an 'orrible cnut... ME! Re: The Forgotten Men of Freestyle! We NEVER hear enough about these guys on here do we?!!! 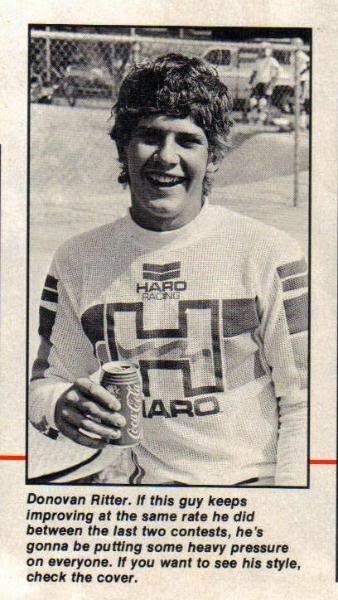 he was an Amazing vert rider in the 80's!! I remember that name?? us rider?? Radder than a Rad thing on a Rad day; maybe? Rob was this the guy who used to hang out in Alpine action in Notting Hill? Was in BMX action bike with another guy, both in Haro gear doing tailwhips? Feature on the first Potts mod bolts. I was in Alpine once and one of those 2 tailwhip guys was in there fixing his bike. I dont know which one, just someone I was with said it was. How cool is that, "Wesyway" on his Haro Pants! Mason was at the RAD Xmas session at Creation last year. He was kickin it on the mini! Still so good! He may be a forgotten rider but the shoe is on the other foot now! Check out the prototype TRICKSTAR!! !